iphone :: ravensword - it's official! Get the word out! The highly anticipated RPG game for iphone, RAVENSWORD : The Fallen King, has officially signed with game publisher Chillingo with an estimated October 15th submission to the app store! Can you wait? I can't! I'm getting my iPhone ready for the download. Check out Ravensword's updated website with all it's new info on the game. They've also posted, to my delight, the Ravensword Bestiary - a pictorial glossary of some of the games interesting characters. 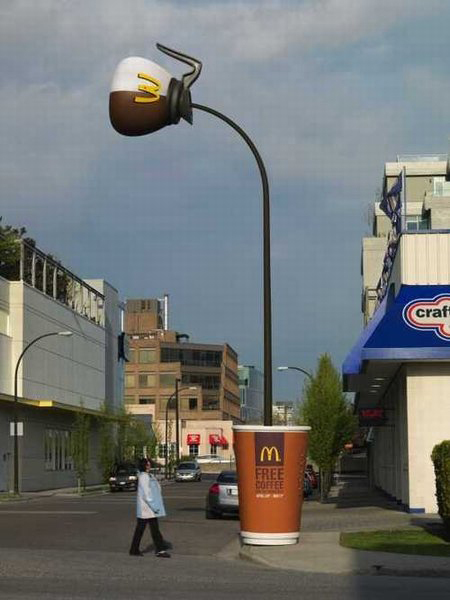 coffee :: i'm lovin' it! What a funny looking lamp post! If you're in downtown Vancouver you can see it up close and personal. Not. 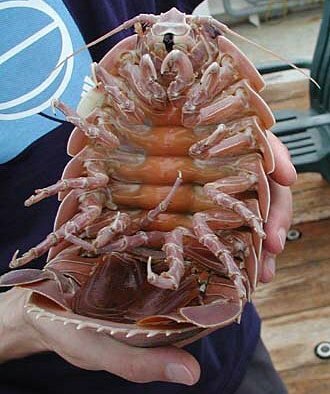 It's the Giant Isopod, abundant in the cold, deep waters of the Atlantic. In Northern Taiwan and other areas, these up to fifteen inch critters are not uncommon at seaside restaurants, served boiled - The white meat being similar to crab or lobster in texture. They look creepy...but I bet they taste delicious. Anthony Bourdain, bring on the butter! These creatures are JUST COOL! I'm still in a quandry over what Moxie and Poppy Petunia will be. Any ideas?? I don't think they'll top these ones though - these halloween canines are way JUST COOL! "In the garden of my house there's a tree with lots of randomly grown twigs. It looks odd and nice at the same time. One day I asked myself if I could create a piece of music with it. Love this!! It's JUST COOL! iPhone news :: ravensword to announce publisher! Newsflash people - I have the inside scoop that Crescent Moon Games will be announcing it's publisher of choice for it's highly anticipated RPG game for the iPhone / Ipod Touch RAVENSWORD - The Fallen King in the next couple days! Tune in RIGHT HERE for this big announcement! Several publishers have been courting Crescent Moon for the game but the final decision has been made. COUNT DOWN until game release HAS BEGUN! It's JUST COOL! A nifty DIY project for an IPhone / Ipod Touch dock that you can make out of any paper, patterned or not, that you please! Download the pattern from French designer Julien Madérou's website. DIY that is JUST COOL! This rare waterproof cat uses the waterfall method to quench his thirst. iphone :: ravensword, the game we've been waiting for! 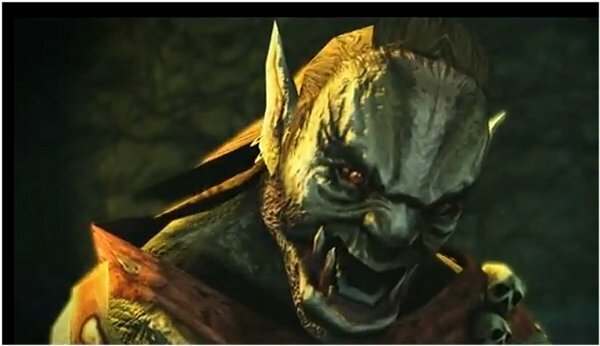 Ravensword: The Fallen King is currently the most anticipated action RPG for the iPhone and iPod touch. The game contains a massive environment to explore, almost 50 characters (beasts and NPC's) Many missions, side missions, and mini games. There will be an expansion pack soon after the first release and frequent updates. RAVENSWORD The Fallen King - It's JUST COOL! 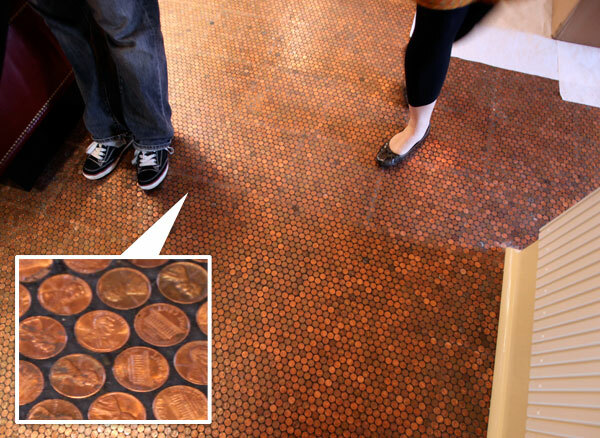 What do you think about this awesome looking floor?Entirely made of copper pennies , you'll find it over at the Standard Grill in NY. If the place sounds e familiar, it's because I did a post about this uncommonly cool Hotel about a month ago. 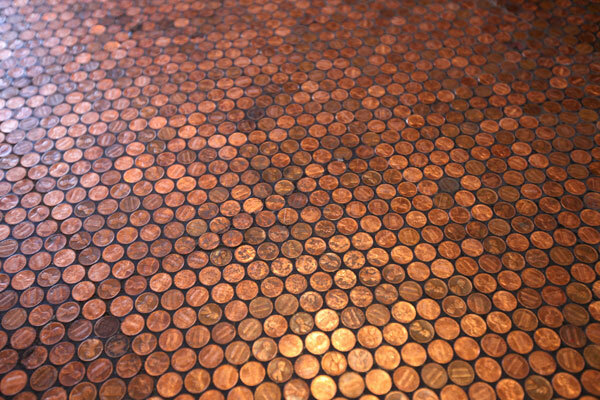 Of course since the Standard is anything but standard,the restaurant’s designers, Robin Standefer and Stephen Alesch of New York-based design firm Roman and William went with thousands of glistening copper pennies for a spectacularly JUST COOL look. iphone :: capture a color! When was the last time you saw a color that you loved, wanted, just had to have to paint a room or a piece of furniture? It happens to me all the time! Now you can use the ben® Color Capture™ app for iPhone where you just take a photo of the "thing" you like the color of, and it finds that coordinating color in the Benjamin Moore Paint Line. The app even goes beyond that to find the best coordinating colors, where to find a dealer and more. I always use Benjamin Moore anyway because the paint has great coverage and their colors are the best, so I downloaded the app and am i appy! Check out the video for Capture-a-color that explains it better than I can. Love this app! It's brilliantly JUST COOL! Hmmm...I was wondering what I should do with that drawerful of now obsolete light bulbs. I'll turn them into funky chicken art! How JUST COOL! Are you looking for an end of summer getaway and don't know where to go? Branson Missouri is well known as the entertainment capital of the Midwest and there's all kinds of entertainment and attractions there. Hilton Promenade at Branson Landing and Hilton Branson Convention Center Hotel are great places to stay, offering their guests access to shops, boutiques, restaurants, a river walk and other attractions. This summer Branson has ongoing events and entertainment like exciting concerts by Lost Highway, Firefall and Big Smith at the Branson Landing, the 21st Annual Downtown Branson Fiddle Fest, Silver Dollar City’s fun-filled National Kidsfest and Southern Gospel Picnic, and much more. And if you stay at either hotel, you are conveniently located within easy driving distance to Branson’s championship golf courses, lakes, museums and 49 live entertainment theaters. The town itself has a lot to offer also including their town square, which features a spectacular water fountain with a light and fire display choreographed to music. With so much to offer, this exciting vacation community is perfect for everyone! It's good to know that the Hilton always has an exciting vacation package for every season of the year including now! So check them out! Looking for an unusual getaway? A hotel in Stavoren, a very old port in northern Holland may be just the place, especially if you are a wine lover. Why? Because the room you will be staying in is actually a 15,000 litre wine barrel that once contained Beaujolais wine. Hotel De Vrouwe van Stavoren's old oak casks make excellent (and I imagine fragrant) rooms and rates for a cask room are priced from 74-119 Euros a night with discounts of up to 75% off depending on the season. Have a beef with how the country's being run ? I don't know if photographer Dominic Episcopo, an artist out of Philadelphia, does but he's turned beef into the theme of his series "The United Steaks of America" that uses ribeyes and sirloins to carve out our country. Which steak (I mean state) is your fave? And where's NY?? See more and vote over at the Huffington Post. 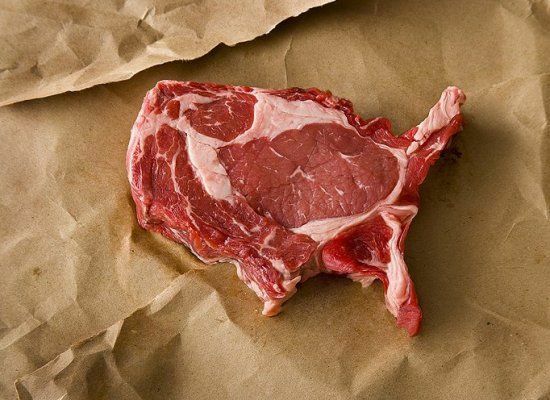 Steaks cut like states - a JUST COOL idea. This quaint antique cottage is anything but antique technologically speaking. It has it's own twitter account and tweets when someone leaves the water running, dinner is ready and even when a mouse has been caught in a trap (there are a lot of those out in the English countryside). The houses Master, Dr Andy Stanford-Clark - who has the job title of distinguished engineer and master inventor for IBM computers (no wonder!) 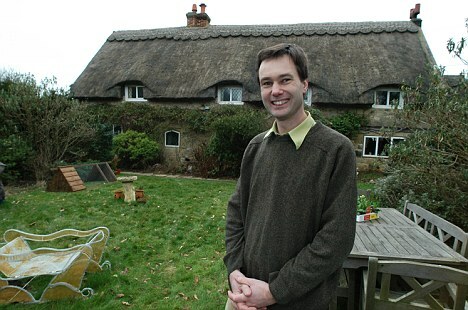 has rigged the 16th century dwelling with hundreds of sensors linked to the popular social networking website so it can tweet it's updates regularly.The house can also be monitored and controlled from his cell phone when he's away . Read more details about this home tweet home here. I't JUST COOL! 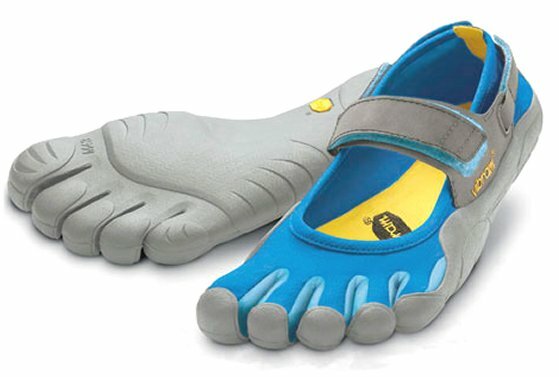 They may look a little odd but Vibram FiveFingers are taking the world (especially runners) by storm. This happy medium between foot gear and comfy barefootedness has been around for years but the company says sales have never been better. Heck even the twittersphere is raving about them. klcollierokc VERY enthused about my new Vibram Fivefingers. Strangest? Coolest? Most invigorating footwear on the planet. Did I mention strangest? quanza snagged a pair of Vibram fivefingers! w00t! johnsifferman tested my new pair of Vibram FiveFingers KSO's today - first impressions = excellent minimalist footwear! The ultra-thin socks made from hard-wearing neoprene are said to help prevent injuries including ankle sprains and sore knees and sell for around $90 giving their wearers a real run for their money.They are like gloves for feet that basically give the sensation of being barefoot while still protecting the skin.Manufacturers say they act like a second skin and force the wearer to land on the center of the foot and not the heel which fits with natural balance. Lookin' a little strange to me - but gotta agree, they are JUST COOL! 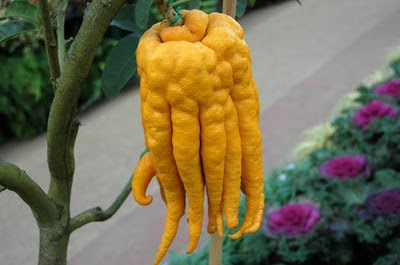 Divine intervention has surely brought some funky looking fruit to the table in the past few years. If the oddly shaped vine grown fruit "Buddha's Hand" isn't odd enough for you then take a look at these heavenly Buddha shaped mini pears which will soon be hitting the produce market. 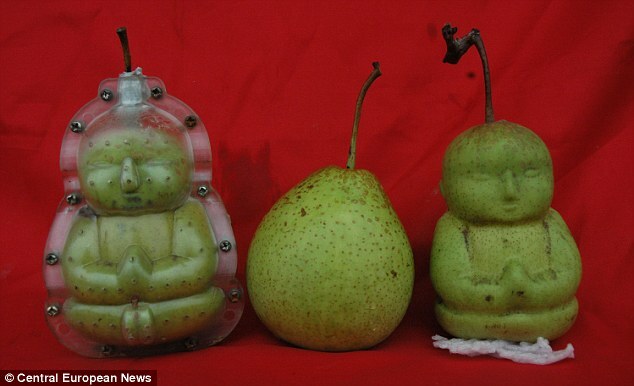 A Chinese farmer has reinvented the pear, growing it into a funky buddha shaped fruit and despite it's hefty cost of $8 each, locals in his home village of Hexia, northern China, considering the fruit to be lucky,have reportedly been buying it up. Gao Xianzhang has created 10,000 of his heavenly pears this season and plans on marketing them throughout the UK and Europe. The farmer spent six years perfecting his harvest, carefully crafting each one which grows inside an individual mold. 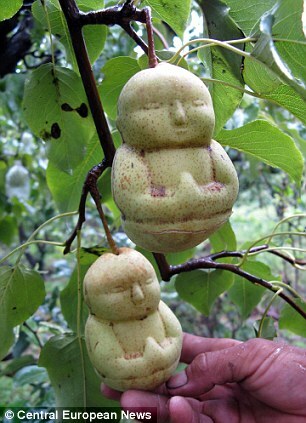 I'm not certain if the pears have divine powers but they sure are JUST COOL! Love these! Just adorable and JUST COOL! iphone :: ravensword is coming!! If you're a gamer and you have an iPhone, you have got to see this awesome and impressive high quality action RPG for the iPhone and iPod touch called Ravensword: The Fallen King. It is due to be released by Crescent Moon within the next month and frankly I CAN'T WAIT! Here are some screenshots , courtesy of touchgen. Click on them to see a larger detailed view. I'll update you on the release date , so keep your eyes peeled on my site for that and more about Ravensword. Because this game is JUST COOL! It takes only about two hours for the creative groomers to carve, coiff and color these doggy masterpieces and add props for the finishing touch. Animal photographer Ren Netherland has been shooting the dogs for ten years now and travels thousands of miles every year photographing these shear beauties at "creative grooming" shows. It's weird but JUST COOL! 16 years ago a group of farmers in Japan began creating 'murals' by planting rice in different colors in Japanese paddy fields. The 'Paddy art' was started as a project to revitalise the local economy. Each year hundreds of villagers and other volunteers help plant the four different colored varieties of rice in the vast fields, planting purple and yellow-leafed kodaimai rice along with their local green-leafed tsugaru roman variety. The rice is planted in May and the creations bloom to their best in September . Painting the land - it's JUST COOL!